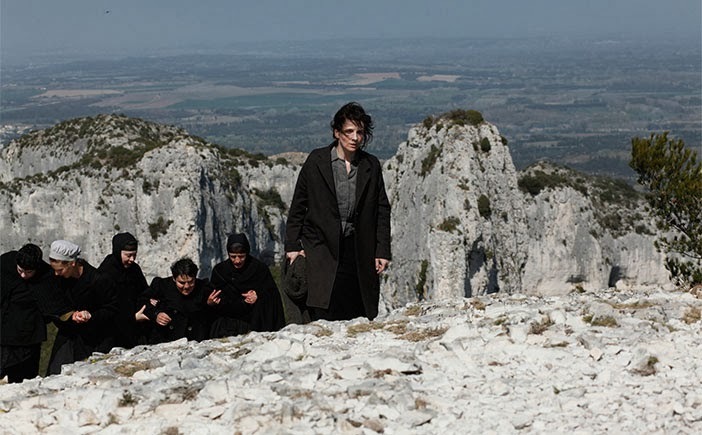 In one section of Bruno Dumont’s Camille Claudel l915, currently playing at Film Forum, her brother Paul (Jean-Luc Vincent), the famous Catholic poet, playwright and mystic, describes how Rimbaud’s Les illuminations and Une saison en enfer actually helped open his mind to God. Rimbaud famously talked about “le dereglement de tous les sens,” "the derangement of the senses" and what is good for the goose is not necessarily good for the gander. He explains that his sister Camille (Juliette Binoche) is too sensitive a soul to withstand the powerful effect of such imaginative sorties on her mind. It is, by the way, unclear who is more insane Camille or Paul whose rationale for committing his sister to the Catholic asylum where she eventually spends most of her life (the film takes place over a few days during the second year of her confinement), constitutes its own form of derangement. Creativity, faith and insanity are the subjects of this portrait of the artist who had been Rodin’s mistress. Curiously Dumont’s film has little to say about Camille’s talent as a sculptress, which is like double jeopardy since she is silenced yet again. In the asylum, Camille also cooks her own food, since she’s afraid of being poisoned--though the movie is no Like Water For Chocolate. From the point of view of content, the association between rehabilitation and faith takes on an almost contemporaneous interest, due to the recovery movement where the belief in a God of one’s understanding is now considered part of the cure—an idea that is still unthinkable to most secular practitioners of psychiatry and psychopharmacology. Camille complains constantly of the harshness of her treatment and of how unbearable it is for her to be confined in an institution filled with gnarled creatures whose loud incoherent cries echo through the halls (Dumont’s apparently used real inmates from mental institutions as part of the cast). Unfortunately Camille Claudel l915 often achieves its empathetic response by duplicating the very boredom and hopelessness that its central figure is seeking to escape. The severity is enough to drive you nuts. Bresson’s subject was also confinement, but the minimalism he subjects his viewers to results in a transcendence that's missing from Dumont’s work. It should be noted that an early scene of Camille being washed in a bathtub recalls David’s The Death of Marat.